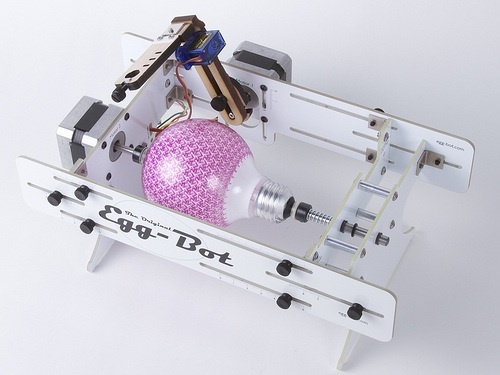 The Egg-Bot Kit @ Evil Mad Scientist Laboratories « Adafruit Industries – Makers, hackers, artists, designers and engineers! We have mentioned Eggbot several times this year as we demonstrated it at Maker Faires in San Mateo and Detroit, as well as at the California state fair. And today, we’re very pleased to (finally) reveal the the design of our new kit. 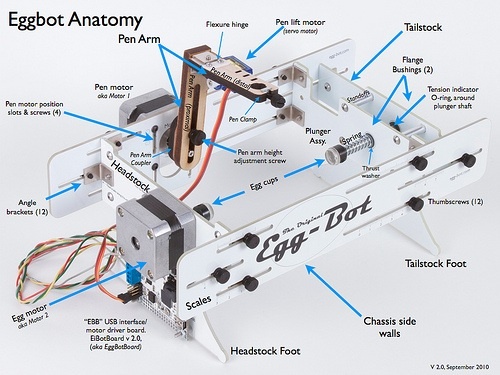 Dose any one know what stepper drivers are in the egg-board ? But I couldn’t find any data about them at Allegro site. Doh- that should be A4983; I’ve sent a note and he should fix that page soon. Thanks for catching it! Ooops. So sorry – silly dyslexia. I’ve now fixed it on the website. The driver is the Allegro A4983 chip. It’s the cheapest 16x microstepping driver I’ve found, and it is _rock_ solid. I just love the thing. Perfect for EggBot where we needed as much resolution as possible without resorting to mechanical reductions.